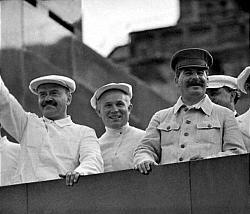 History Today rightly points to the most important event in modern history that happened on this day in 1956: Khrushchev's so-called secret speech (it was, actually, secret in most of the Soviet Union and, theoretically, other Communist countries though the text had reached the West), which, once and for all, undermined the legitimacy of the Communist system even with people who believed in it. On the whole, I am inclined to the second explanation. Call me cynical, if you like, but the deflecting of the blame is exactly what happened and Khrushchev's rivals were eased out of their position. Then again, none of them were imprisoned or shot, which is was a great advance in political methodology. 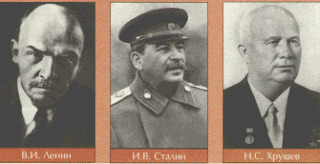 The two pictures I have chosen illustrate quite well where Nikita Khrushchev, himself a veteran of purges, the Ukrainian collectivization and of the Moscow metro construction, fitted. Maybe he did suddenly decide that he had to do something to make up for the blood on his own hands. Maybe. As is well known the first woman MP actually to take her seat in the Commons was a Conservative, to wit, Nancy Astor. This blog has mentioned her a few times before, naturally enough, here, here, here and here. It is, however, worth recalling her career yet again, as today is the anniversary of her Maiden Speech. Thus, on February 24, 1920 was the first time a woman spoke in the House of Commons. 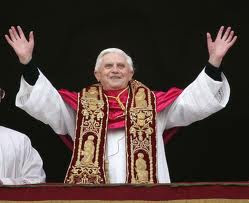 No historian can ignore the astonishing announcement by Pope Benedict XVI that he intends to retire from the Chair of St Peter, announcement that has now been confirmed by the Vatican. The Reuters article is a strange mixture of items and events. The immediate reason given by the Pope was that he felt that his health, physical and mental, was failing and he did not think he could do the work he was assigned by God, well enough. Given that Popes are not supposed to resign, this was immediately dismissed as being merely an excuse. His predecessor went on despite his obvious growing frailty, say those who find the argument unpersuasive. Others, and TH without being RC, agrees with them feel that, perhaps, there needs to be a form of retirement even for the occupier of St Peter's Chair when he feels that his powers are no longer adequate to the immense task. Then the article goes on to discuss the various scandals that have dogged the Pope's tenure, first and most important being the child abuse one, which had gone on for some decades and which was first properly investigated under Benedict. Scandal from a source much closer to home hit in 2012 when the pontiff's butler, responsible for dressing him and bringing him meals, was found to be the source of leaked documents alleging corruption in the Vatican's business dealings, causing an international furore. TH has never been able to understand that furore. Was anything proved beyond the fact that His Holiness had hired the wrong man to be his butler? Then we get an account, which is surely to the Pontiff's credit of his visit to the site of a Nazi death camp and his effort to confront the evil that is in his country's past. Scrupulously, we are told that while he was a member of the Hitler Jugend, which was compulsory, he was not a member of the Nazi party and his family had opposed Hitler (though, presumably, not strongly enough to suffer some of the truly horrible punishments). So much for the "Nazi Pope" that we sometimes get from rabid Germanophobes. Finally, there is the "scandal" of the Pope quoting "a 14th century Byzantine emperor as saying Islam had only brought evil to the world and that it was spread by the sword". The inevitable riots followed and a nun was killed. Apparently, the scandal was not the fact that there were bloody riots in response to a historical or political comment but the comment itself. Naturally, TH looked up the last Pope who had resigned, Gregory XII in 1415, during a serious muddle in the papacy and the time of many Popes. 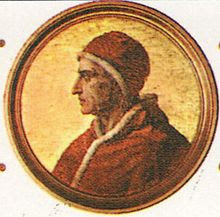 Gregory was elected the pope of Rome in 1406 with the understanding that he would quickly resign if the pope of Avignon, Benedict XIII, would do the same. 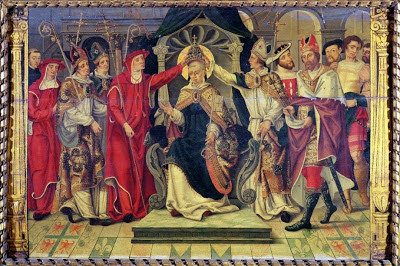 After a decade of negotiation and maneuvering, in which a third pope was elected, Gregory finally stepped down and became a bishop. When Benedict refused to resign, he was excommunicated, and Martin V was elected in 1417 as the sole pope. There really seems to be little in common between the two events. Can we compare this resignation to that of Celestine V in 1294? Because Gregory XII’s resignation was part of a brokered settlement, a more appropriate comparison to Benedict’s situation might be Pope Celestine V, who resigned in 1294, Housely said. Celestine was a hermit when he was elected pope and he quickly quit to return to solitude after “he found the office too onerous,” he said. TH finds it a little odd that a number of people reacted to the news by casting opprobrium at Tony Blair with funny little jokes about him wanting the position. This obsession with any politician seems extremely odd. The resignation will take force from February 28, in the middle of Lent. We shall be watching that chimney again. Yesterday we remembered the last Plantagenet King; today we celebrate Queen Elizabeth II's Accession to the Throne. It came about considerably more peacefully than that of Richard III or Henry VII but much of the language of the Proclamations dates back to those historic days with some allowance being made for the Commonwealth whose Queen she is, too. There can be little more said on the subject until we hear definitely on whether Leicester Cathedral will reinter the bones and what kind of ceremony will be put together. 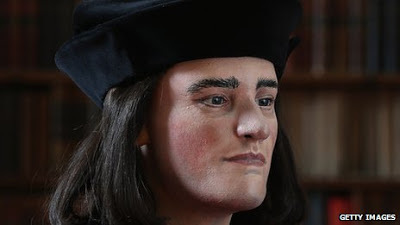 However, there is some interest in the reconstruction of King Richard's face on the basis of the skull and using advanced computer technology together with older fashioned wax modelling. The article in the Independent seems to have been written by someone who has not seen the famous portrait in the National Portrait Gallery, the starting point of Inspector Alan Grant's investigation in Josephine Tey's excellent Daughter of Time. 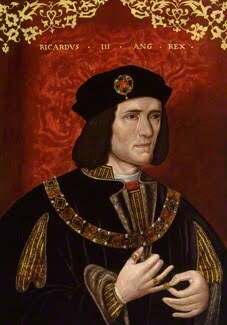 All known portraits of Richard III were painted after his death and do not show him in a particularly flattering light, which suited the Tudor’s dynasty’s portrayal of him as one of the great villains of history. In fact, the fascinating aspect of the reconstruction, pace the journalist in the Independent is how close that face is to the portrait. Either those who worked on the reconstruction were influenced by the portrait or the latter was very life-like.